Ever since I did the Dilip Kumar post, I’ve been on a mission to watch the actor’s movies. I’ve deliberately kept to the lighter part of his oeuvre – Ram aur Shyam (since that came up so much in the comments), Tarana (again! ), Kohinoor, Madhumati, Yahudi… when I realized to my horror that I hadn’t – yet – reviewed Madhumati. That was insane – it’s a movie I love (I love this type of ghost stories), I love the music, and I really, really like Vyjayanthimala and Dilip Kumar. And of course, it was a Bimal Roy film. Madhumati, like all good ghost stories, begins on a dark, stormy night. A car drives through the pouring rain, slowly navigating the winding mountain roads. Inside are two men, Devendra ‘Deven’ (Dilip Kumar), an engineer, and his friend, a doctor (Tarun Bose). They are on their way to the railway station to meet Deven’s wife, Radha and their newborn son. Deven is very anxious to get to the station on time, but a landslide blocks their onward journey. The driver goes for help, advising his passengers to seek shelter in a haveli up the mountainside. Reluctantly, Deven gives in to the doctor’s sage counsel and the two men make their soaking way up to the deserted mansion. As they step in, Deven is overcome by a sense of déjà vu. He remembers there was used to be a picture on the wall in the large hall. Outside, the rain continues to pelt down, and they fall into an uneasy sleep until Deven is jolted awake by a scream, and later, by the sound of anklets and the snatches of a song far away. Much to the doctor’s surprise, Deven also recognises a portrait in the upstairs room – that’s Ugranarain, he says. The caretaker is surprised – yes, it is the late zamindar. Yes, he had painted that portrait, comments Deven, uneasily. The doctor is justifiably surprised. How does Deven know this place? And what does he mean he painted the portrait? When it ends, he hears a haunting refrain. Eager to know who’s singing, Anand hurries along, following the voice. The song stops, and suddenly, Anand hears a shouted warning. Anand hadn’t noticed that the next step would have plunged him to his death. Anand soon takes up his job and as quickly, makes a few enemies – the accountant, who’s been skimming money off the estate; Vir Singh (Tiwari), the overseer, whom Anand crosses, etc. He’s also made aware of the local taboos – no crossing the stream; Pahan Raja, who lives on the other side, is a sworn enemy of the ‘company’. His son had been murdered by Vir Singh, and Pahan Raja has sworn vengeance on everyone associated with the estate. He also learns something very important from Charandas (Johnny Walker), his general factotum – Pahan ‘Raja’ is king merely in name; his ancestors were once upon a time the rulers of the area. Now, the power rests with the owner of the timber estate, Raja Ugranarain. He’s the wastrel son of the late owner, but Anand hasn’t yet met his employer – he’s warned that the man is a short-tempered, power-hungry despot. Anand, however, pays no heed to the boundaries. One day, as Anand sits across the stream sketching, his sketches are stolen. When he accosts the thief, it turns out to be the young woman he’d heard singing in the hills - Madhumati ‘Madhu’ (Vyjayanthimala). Anand runs into her again at the local fair. She sneaks as many glances at him as he does at her, even though she’s too shy to approach him. As Anand sits sketching the local colour, he soon notices a young boy in the path of a wayward horse, the rider obviously not too bothered about who’s in his way. Hurriedly rescuing the boy, Anand hands him over to his relieved mother. However, he’s hurt his hand badly, and Madhu, putting her scruples aside upon discovering that ‘babuji’ is a very nice man indeed, comes to his help. She applies some rudimentary first aid, but exhorts him to come with her to her father – he is skilled in forest medicine and will soon treat the wound. Pahan Raja (Jayant) willingly treats Anand’s wound when his daughter explains the circumstances. The friendliness soon disappears – just as soon as Anand tells him where he works. He promptly kicks Anand out, and forbids Madhu to go after him. However, this is no bar to Madhu’s and Anand’s romance. Unfortunately, Anand has made a powerful enemy. The careless rider at the fair was his employer, Ugranarain (Pran), who had not appreciated Anand telling him off in front of the villagers. Anand’s lack of servility irritates the Raja. While Anand is busy meeting Madhu every spare moment, Ugranarain, who comes across Madhu’s portrait is smitten by the beautiful girl. And Vir Singh, wanting his revenge on Anand, feeds the Raja’s lust with tales of Madhu’s beauty. One evening, upon the pretext of wanting some accounts looked at, Ugranarain keeps Anand working late in the office. Madhu waits for him impatiently, only to find Ugranarain on her trail. That evening she manages to escape. The next day, she tells Anand that the Raja is ‘a bad man’ but doesn’t tell him why. Days pass, and Madhu is blissfully happy. Already attracted to each other, their frequent meetings in the forest – ‘when the shadow of the tree falls on this rock’ – lead to them falling deeper and deeper in love. They spend a few blissful evenings romancing (and singing and dancing). Until one day, when she’s about to visit Anand as usual, and her father returns unexpectedly. He forbids her from stepping out. Anand is frantic when Madhu doesn’t show up at their regular time. That night, he makes his way to her house, only to be caught by Pahan Raja, who’s furious that his daughter’s honour has been besmirched. He doesn’t trust any ‘company’ man, but seeing his daughter’s faith in him, and Anand’s own honourable intentions, Pahan Raja gives his consent to their marriage. Later that week, Anand is sent by Ugranarain on a made-up trip to the town. Pahan Raja is also leaving for a village fair far away, and Madhu, for once afraid, tries to stop Anand leaving. Shaken by a premonition of doom after an inauspicious omen at the temple where she’d gone to pray for Anand’s well-being, Madhu is desolate. Anand ‘marries’ her in front of the deity to reassure her and Madhu is blissfully happy. That happiness is shortlived. That night, Madhu is lured to the haveli by Charandas who becomes an unwitting accomplice to Vir Singh’s plot. It is another dark stormy night, and poor Madhu, rushing to find her wounded babuji finds Ugranarain instead. When Anand returns, it is to find a distraught Pahan Raja searching for his daughter. The hut was left open, there was charred food on the stove, and Madhu is missing. All they find is her dupatta, and Pahan Raja sadly says that his daughter’s been eaten alive by some wild animal. Pahan Raja is a fatalist, but Anand is unable to come to terms with Madhu’s disappearance. Until Charandas tells him how he’d become an unwitting pawn that fateful night. Anand confronts Ugranarain, but is driven away by the latter’s men who beat him senseless. Charan, who sensibly remains hidden, takes his chance and drives Anand to hospital.Upon his release, Anand moves to the Dak Bungalow, where he spirals into a vortex of melancholic depression. Who is she? Madhumati? How can that be? Has Anand finally lost his grip on sanity? Dilip Kumar and Vyjayanthimala make a wonderful pair on screen, and their romance is both believable and something one roots for. It was top-notch acting, and won for Vyjayanthimala a Best Actress nomination at that year’s Filmfare awards. (She won for Sadhna.) The role also gave her a chance to display her dancing prowess. Pran could play the suave villain to a hilt, smoke rings et al, and here, clad in jodhpurs through most of the film, he brought the ‘evil zamindar’ to life. Johnny Walker makes me smile every time he appears on screen (though I could have done without the witch doctor). His introductory scene is a delight – when Anand first arrives, and reaches a fork in the road, he’s unsure which branch to take. So, he flips a coin but it disappears into thin air. Bewildered, he looks up, only to find Charandas sitting on the branch above. He soon appears before Anand – hanging upside down. Or the scene where Charandas is boasting to the villagers about how he rules over Anand. As he spins his tall tales, Anand joins the group behind him, and interjects, ‘Phir?’ (And?) Charandas continues to brag until, realising it’s Anand, trails off sheepishly. 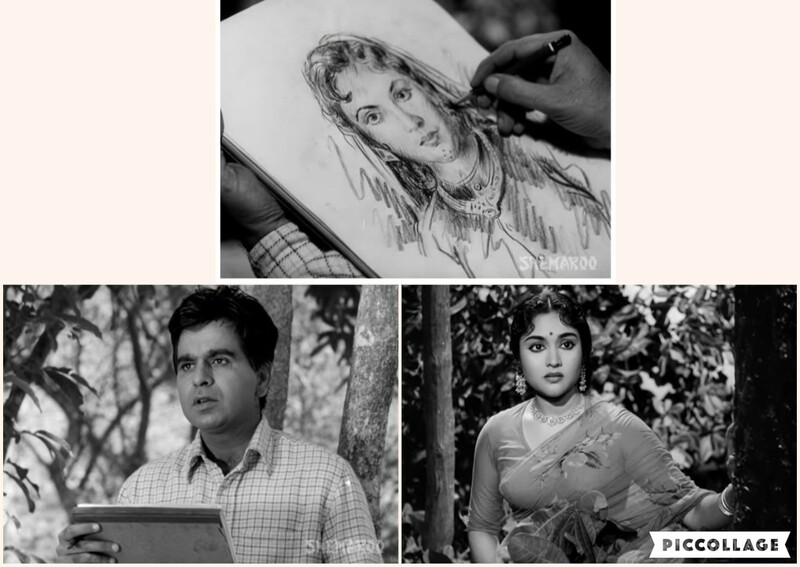 Then again, I liked Bimal Roy’s direction and his use of light and shade to emphasise the beauty of the landscape, or the horror of what’s happening to Madhumati, or even the barrenness of Anand’s life after her disappearance. 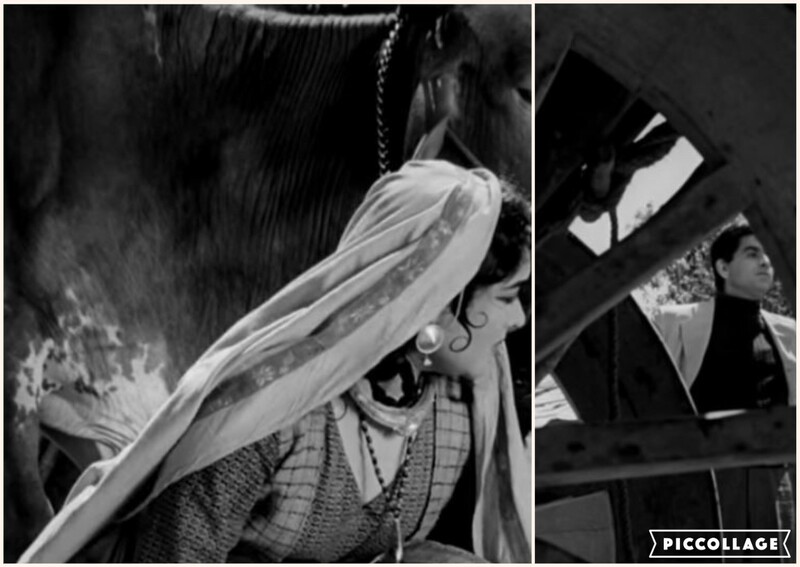 Black-and-white (cinematographer Dilip Gupta) captures the nuances of ‘mood’, in a way that colour doesn’t. Roy also captures Madhumati’s will-o’-the-wisp quality – through long shots of her dancing in the mists in Aajaare pardesi. Or take the Zulmi sang aankh ladi number – before the song begins, Madhu catches Anand’s eye from behind a cart. As the girls begin to dance, and they move in front of the cart, Madhu disappears. When you see her next, she’s watching Anand through the spokes of the cartwheel. Later, when she’s dancing, she keeps a lookout for Anand, who’s moving around in search of a vantage point. When she finishes a twirl and looks for him in the place where he stood before, he’s not there any longer. The expression on her face as she sings, ‘Meri paagalpana toh koi dekho Chanda ko pukaroon saajan ke naam se’ is extremely self-aware. It’s a beautiful shot. Madhumati wouldn’t be Madhumati if it weren’t for the music. One of Salilda’s most successful scores (and he took home a Filmfare award for Best Music), each one of Madhumati’s many songs, whether the ethereal Aajare pardesi, the folksy Zulmi sang aankh ladi, the pathos-laden Toote hue khwaabon ne, the romantic Dil tadap tadap ke or the rollicking Jangal mein mor nacha, was a delight. His background score, using bird calls, the pitter-patter of the rain, the rushing of waterfall, even the sound of the timber being sawed, complemented the mood of the film. Madhumati was, of course, Roy’s most commercial film ever. I really don’t know why it is often referred to as a ‘reincarnation’ film, since Deven is there only so the story can have a narrator. It is, however, a compelling ghost story, and the setting, the music and the cinematography all combine to give you a lyrical masterpiece, visual poetry on celluloid. Wishing all my readers a very, very Happy New Year. As Alfred, Lord Tennyson wrote in The Foresters (Act I Scene III): '...but Hope smiles from the threshold of the year to come, Whispering, 'It will be happier'...' May your lives be filled with hope and good cheer.